For food lovers, epicureans, and gourmands, the most exciting international element of the upcoming World Equestrian Games will be the farm-to-table inspired and globally-influenced Celebrity Chef Dinner Series — for 16 nights, world-renowned chefs will team with Kentucky’s most celebrated culinary talent to create a series of fresh, seasonal, local, and sustainable dinners. The program has paired with Kentucky Proud and the menus will rely heavily on local farms, brewers, distillers, vineyards, cheese-makers and more. Chef Jonathan Lundy (of Jonathan at Gratz Park) will team with Michael Schwartz of Michael’s Genuine Food and Drink (Miami) and Traci Des Jardins Jardiniere, San Francisco. 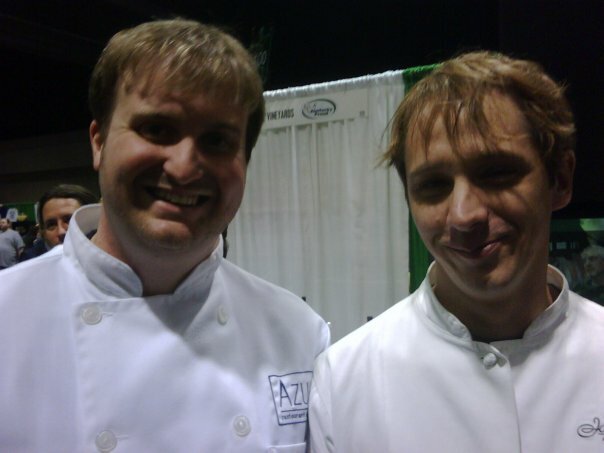 Jonathan was voted BEST LOCAL CHEF in the 2010 Ace Best of Lex READERS’ Poll. Jeffrey Newman of Berea’s Boone Tavern will be paired with Sanford (“Sandy”) D’Amato of Milwaukee’s famed Sanford. and Anne Quatrano of Bacchanalia, one of Atlanta’s most highly regarded farm-to-table restaurants. Brandon Ginter of The Julep Cup will partner with Joseph Lenn of the extraordinary Blackberry Farm and Nancy Oaks of San Francisco’s Boulevard Restaurant. Paul Weckman of Covington’s Otto’s and Francis Schmitz of Louisville’s Bristol’s Bar and Grille will team with DC’s Roberto Donna and Andrea Reusing of Chapel Hill’s Lantern Restaurant. Her upcoming cookbook is Cooking in the Moment: A Year of Seasonal Recipes . Portofino’s Nat Tate will be paired with Jonathan Eismann of Miami’s Pacific Time along with New Orleans Celebrity Chef John Besh. Bellini’s Andrew Myers will team with Alabama’s James Boyce and Joachim Splichal. Erik Fowler of Lexington veteran restaurant Dudley’s, now thriving in its new home on Short will be paired with Marc Vetri and Tim Byres. Louisville’s John Varanese will cook with Memphis’s Wally Joe, and John Sundstrom of Seattle’s Lark. Louisville’s James Gerhardt will team with DC’s Todd Gray and L.A.’s Suzanne Tracht. Multiple-James Beard-nominee Kathy Cary (chef/owner at Lily’s in Louisville will team with San Francisco’s Emily Luchette and Mark Franz . Justin Thomas of a local winery/bistro will be paired with Paul Kahan of Chicago’s Blackbird and Celina Tio of Kansas City’s Julian. Chef Jeremy Ashby of Lexington’s Azur Restaurant will be paired with Bernard Guillas and Jose Garces. Chef Jeremy Ashby was a runner up in the Best Local Chef Category in the 2010 Ace Best of Lexington Readers’ Poll. Azur Restaurant was voted best fine dining in the $100 range in the Ace Best of Lex Readers’ Poll 2010 and 2009. Michael Paley of Louisville’s award-winning Proof on Main will team with Santa Fe’s Mark Kiffin and New Orleans’ Frank Brigtsen. Anthony Lamas of Louisville’s Seviche will be paired with Philippe Boulot and Vitaly Paley, both of Portland, Oregon. Ouita Michel was a runner up in the Best Local Chef category in the Ace Best of Lexington Readers Poll. Her restaurant, Holly Hill Inn, was voted Best Restaurant for eating locally. Edward Lee of Louisville’s 610 Magnolia will conclude the series when he teams with Oxford Mississippi’s John Currence and Charleston’s Mike Lata . Maybe Sotheby’s should host one of their$1,000/crate heirloom veggie auctions here?